Protesters march in Chicago during a demonstration for 17-year-old Laquan McDonald early Wednesday. More police officers are being prosecuted for killing people — and the availability of video evidence is a big reason why. The power of that evidence to change the narrative surrounding a killing was made clear Tuesday when the city of Chicago released a video of a police officer shooting a teenager that dramatically differed from earlier police accounts and led to a murder charge against the officer. An early report in the Chicago Tribune of the October 2014 shooting by a police officer of 17-year-old Laquan McDonald, citing “authorities,”1 said McDonald was holding a knife and “allegedly lunged at police, and one of the officers opened fire,” shooting him in the chest. On Tuesday, 13 months after the shooting, Anita Alvarez, the state’s attorney in Cook County, Illinois, announced first-degree murder charges against Van Dyke in the shooting of McDonald. The announcement was made a few hours before the release of the video, which the city of Chicago had resisted for months until it was ordered to make the video public by a Cook County judge on Thursday. Chicago Mayor Rahm Emanuel decided not to appeal the ruling. Van Dyke’s lawyer said the shooting was justified because the officer feared for his own safety and that of the other officers present. “Video is making a huge difference in cases that I don’t think would have resulted in charges against a police officer but for the video,” Stinson said in an email. Video evidence doesn’t guarantee indictment or conviction. None of the 15 officers charged this year with fatal shootings has been convicted. One, Lisa Mearkle, was acquitted this month after a trial in which the jury was shown video of her shooting David Kassick. Most of the rest of the officers won’t start trial before the end of the year. 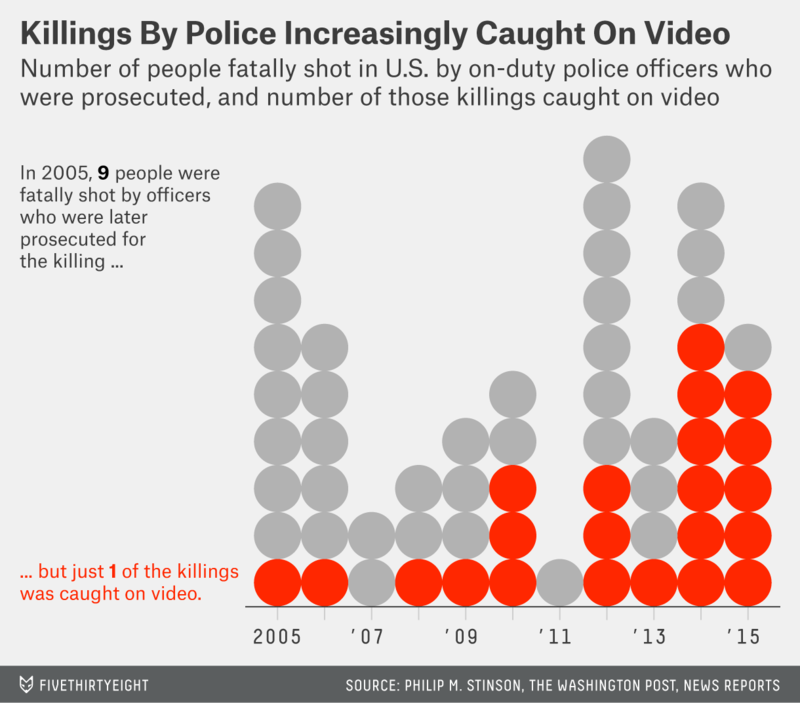 And the increasing availability of video evidence doesn’t appear to have coincided with a reduction in the number of people killed by police, a figure that dwarfs the number of police officers prosecuted for fatal shootings. (The vast majority of people killed by police officers are killed with guns.) Killed By Police, a Facebook page that tracks police killings fairly accurately, has counted 1,072 police killings so far in 2015, compared with 1,108 in all of last year. The federal government doesn’t keep a reliable count of police killings. The only person quoted by name in the article was a spokesman for the Chicago police union. These numbers are based on Stinson’s database, his collaboration with The Washington Post earlier this year and other news reports. They may have changed and may continue to change because some officers are charged in a year after the one in which the fatal shooting occurred. Six of the 15 officers charged this year for a fatal shooting — including Van Dyke — were being charged for one that occurred last year, and two were charged for 2013 shootings.